The table, the bench, and the chest; the three most basic pieces of furniture are found in some form in almost every home in every culture tracing back to the origin of furniture. The chest in its early form was heavy, durable, often supported with iron straps. These sturdy pieces were designed to sustain transport over great distance both land and see, containing and protecting the family's valuables. Ships' records often itemize chests to as the sole items of furniture accompanying many settlers. A basic chest is nothing more than six panels, four sides, a bottom, and a lid. Early configurations had strap, brass or iron, or wooden dowel hinges. A chest is a colonial closet, since none existed at that time, the basement, if any, was reserved as a root cellar, and the attic often slept the children. The floor was also dirt or wood plank, so keeping items above the surface became critical to health. This left little space, so people stored all the important household items in chests. 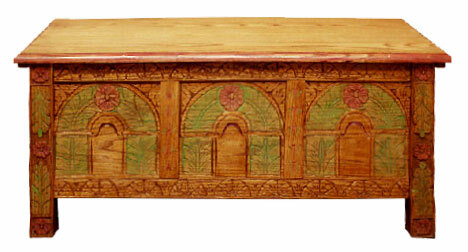 This fine pine chest by Artisans of the Valley is an early John Goddard design. The original plans have been handed down in the family of Mr. Saperstein's teacher from craftsman to craftsman. The pine chest was a favorite in colonial times because it was made of six pine boards nailed together, serving as a sturdy, but easily movable trunk. This chest is featured as a period example in The Genealogy of Sustare, tracing the linage and descendants of Captain Don Gabriel Sistare ( new full name -Lazaro Jos� Gabriel Sistare II) We always enjoy when our pieces are useful to organizations, educational projects, or other research. The chest served for both storage and as a basic seat or table; why bring a bench when you can sit on your storage locker? Larger chests made the perfect table. Chairs were a luxury in most homes, the more established model colonial dwellings featuring simple plank benches. Instead of a paneled top in the English fashion, the Colonial chest had a plain pine board top. This unadorned top surface was ideal for seating, with or without cushions. Many households had several chests, and could not do without one of these blanket chests at the foot of their beds, with often no source of heat within the bedroom; fast access to storage was considered a necessity. During warm seasons the blanket chest stored bed covers in a convenient location, often employing cedar chips or linings to ward of insects. This Circa 1650 Connecticut Style Blanket chest was common during Colonial times to store blankets, pillows, and other personal items. Chests are often decorated carving, sometimes painted to highlight even further. 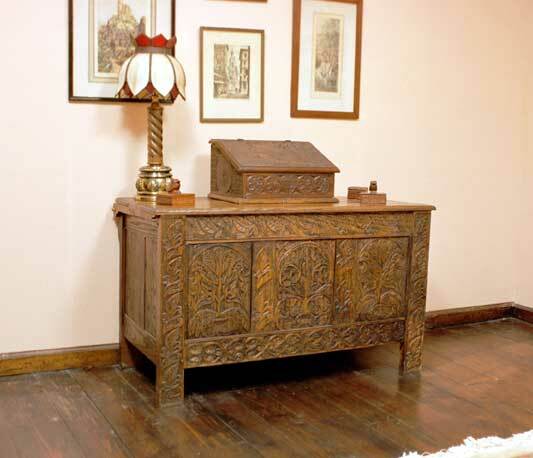 The chest shown is a smaller version of the Connecticut chest style, and is available for inspection in our showroom. The integration of the chest into colonial culture was deep. For example, the term "dowry chest" evolved from the tradition of taking the brides belongings and dowry to her new home in her chest. In turn, evolved the name "hope" chest, now commonly used to describe the basic chest, it was once used to describe the build-up of items in a bride's chest in "hopes" it would become a dowry chest. This beautiful carved oak chest below is a reproduction of a chest attributed to Kalem Winslow, coffin cabinetmaker to the Pilgrims. "Constructing and Carving an Heirloom Blanket Chest" by Stanley D. Saperstein, 1974 featured in "Chip Chats." Stanley's formal apprenticeship graduation required completion of a piece to define his journeyman status. His Connecticut Chest served this purpose, and won a feature article. 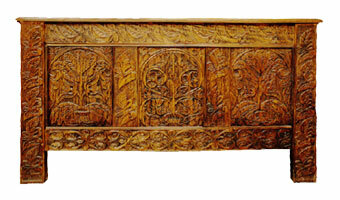 The Connecticut Chest is one of the rarest pieces of American furniture, with only fifty known pieces in existence. Woodcarvers and cabinetmakers, highly trained in England, who lived along the Connecticut River, produced the chests. Mr. Saperstein, who has made the only reproduction of the Winslow chest, is one of a handful of craftsman able to make these fine oak chests. In fact, on one occasion, the chest shown above was found by jury to be an antique, and the show was only for pieces made by the artists themselves. A discussion followed, Mr. Saperstein having to convince the jury he did in fact make the chest. This is the ultimate complement for a reproduction furniture maker, to have his piece mistaken as genuine. The basic form of the chest began to change from its simplistic origin, and this foundation grew bureaus, highboys, secretaries, and other configurations. Since people were beginning to stay put in many now urbanized areas towards the 19th century, drawers were added to the basic form, increasing the height, and gradually a different piece of furniture evolved called the mule chest. The drawers in a mule chest were used to store slippers called "mules" by the colonists. A mule drawer was a single drawer at the base of the chest. The form of the chest, a basic box, can take shape in many size variations. In fact, a coffin is a box or chest, coining the term "coffer" a variation of a coffin, as a synonym for chest. Cabinetmakers of colonial times often served a dual roll as furniture and the town's coffin maker. As time freed up, tools improved, and available labor grew; coffers evolved into ornate forms featuring carvings, drawers, and other functional or ornamental options. Blanket chests were constructed of various species of lumber depending on season and availability. Chests have been constructed from the most inexpensive pines used for "country" type furniture to hardwoods such as walnut, cherry, and imported mahogany. Pine chests were often designed for the abuse of transport, and could be repaired or discarded without too much upset to the budget. Hardwoods were used for formal pieces of furniture, ordinarily reserved for the wealthy. 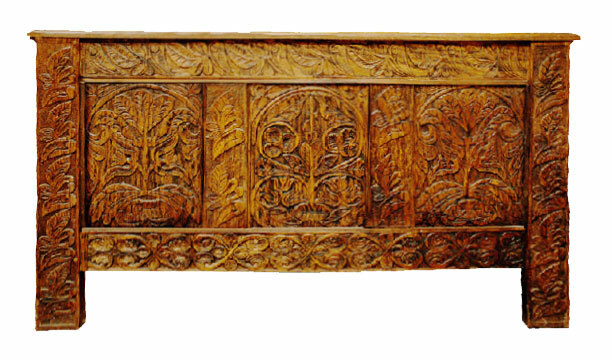 Finishes varied, most stains in the dark Jacobean range while the painting traditions of Pennsylvania Dutch fathered stenciling and developed the traditional decorative motifs of floral, leaves, and other patterns still in use today.